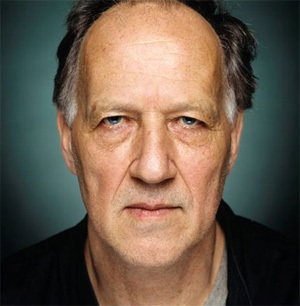 There is no doubt a personality disorder called STBOS -BWNTBSTMTACAU*: I need to say about Herzog’s non-fiction that he films it in feature film style, which is in sharp contrast to the default style coming from cinema direct/cinema verite tradition. Even his colouration and mis-en-scene is big-filmic. This has a strange but satisfying effect, a kind of equivalent visual effect to the aspects of the contrapuntal in music. With this in mind, I am a little bit disappointed with some of the music he uses, particularly in films like Lessons in Darkness. Though music can be used to almost poke fun at the cinematic. In the oily-boy story – which is as riveting as any he has made – the music is what can only call kitsch because of its relation to the visual: that is, it is not kitsch in and of itself, but becomes so when associated with the particular visuals he uses. I would be prepared to argue this one! But it does need a sort of reply that includes the details in shot (moment-by-moment) specific film terms to explain why my opinion is wrong. The music in Dieter does work very well unlike that in Lesson in Darkness. One is reminded of Dr.Strangelove: I can’t give chapter and verse right now, but will add to this post when I re-look at some extracts of the Kubrick. Even if one can see where Herzog is going with all the heavy music with its deeply ironic tone, it is not as one-to-one as one might think on first seeing/hearing the film. There are many layers to the symbiosis between the music and cinematography in Lost. Repeated watching highlights subtler colours within the, at first, seemingly bleeding obvious purpose to this particular set of sound backdrops.